Even if you and your siblings went your separate ways as adults, a parent’s needs may bring you back together at midlife. You’ll face a crisis or have to address chronic issues that limit your parent’s independence. Enter a common problem: sibling friction over elder care. This post will help you identify sources of sibling friction over elder care and other issues that arise as parents grow older. It will also suggest some practical steps you can take to reduce friction and keep the focus on your parent’s best interest. At root in sibling friction over elder care is some sort of injustice. This can be a real injustice. For example, all but one sibling might ignore their parent’s problem. They leave it to one sister or brother to provide all physical, emotion and financial support. Injustice also can be perceived, and often perceptions matter as much as reality. For example, if a sister feels her contributions aren’t valued by her parent or siblings, she might harbor resentment against the others. Sometimes one’s perception has little grounding in fact. It can even stem from long-time family roles and assumptions. All the same, perceived as well as real injustice drives a wedge between siblings. It’s hard enough to insert yourself into your parents’ lives if they think you’re meddling. Balancing respect for parental independence and autonomy with helping them stay safe and comfortable is tough by any measure. It’s even worse if trying to assist a parent dredges up family baggage you thought you’d put behind you. In most cases, however, it’s better to address awkward situations before stakes escalate. Ignoring tensions can lead to major family blow-ups. Don’t put off facing them until you and your siblings confront a health emergency. You and your siblings are trying to act in your parent’s best interest. You may not see eye to eye on potential solutions, however. That’s why you have sibling friction over elder care in the first place. Most social workers and counselors recommend you work out elder care options with your siblings before presenting them to your parent. This advice varies according to whether your parent is receptive to help and/or whether she has cognitive impairment. But you want to get on the same page with your siblings if possible and then present a unified message to your parent. Doing so is especially important if you fear your parent will try play one sibling off against the other. Use “I-statements.” Don’t try to make the other party feel guilty, as that leads to defensiveness and division, not agreement. Holding a family meeting with your siblings is a good way to air people’s opinions. You can do a phone or video call that works with everyone’s schedules and locations. Here are some tips for successful family meetings to reduce sibling friction over elder care. Consider having an experienced outsider facilitate the meeting. It may benefit your family to hire a social worker or geriatric care manager, now often called an Aging Life Care Professional (ALCP). This person has navigated situations like yours before. He or she can keep the discussion on track and acknowledge people’s feelings without taking sides. Consult California’s Caregiver Resource Centers and similar organizations in other states, as well as the Aging Life Care Association website, to find a facilitator near you. Decision makers: has the parent appointed a financial power of attorney and/or healthcare agent? After the meeting, the facilitator should circulate to all attendees a written summary issues discussed and what each person agreed to do. The Family Caregiver Alliance has more tips on holding a family meeting. Family meetings are not “one and done” projects. Especially if feelings are running high, your first meeting may serve only to let siblings vent their frustrations and surface their disagreements. In this case, you’ll definitely want to bring in an experienced facilitator to help you make progress. Even in families where there’s less sibling friction over elder care, regular check-ins are a good idea. For example, you may be the sibling living closest to your parents. Perhaps you initially agreed to provide extra assistance with transportation, shopping and so on. But now their needs have increased. Or something has happened in your life that prevents you from spending as much time helping them as you did before. It’s time for your siblings to step up. But they won’t know unless you tell them. Caregiving is dynamic. Needs change over time. By staying in contact with your siblings via regular communication and family meetings, you can update caregiving responsiblities as needed. Sibling friction over elder care can bring up old wounds. Don’t allow yourself to get sucked into unproductive conflicts. Consult a therapist or other counselor who can help you maintain your equilibrium. Additionally, caregiving tasks are rarely divided equal among siblings. If you’re the primary family caregiver, it’s critical for you to avoid exhaustion, overwhem and resentment. It won’t help your relationships with your parents, siblings, spouse or children if you’re stressed out all the time. But you shouldn’t expect others to discern how they can help you unless you let them know. Consider what you really want and need. List specific ways your siblings might help you. For example, if you need your brother to fly out and care for dad so you can attend your daughter’s college graduation next spring, ask him to do it. Other posts have covered important legal issues like durable power of attorney for financial matters and advance directive for healthcare. Hopefully your parents have already designated agents for decision-making in these areas. If not, work with them to execute the appropriate legal documents. Parents benefit themselves by designating agents for finance and healthcare matters. The agents can be the same or different individuals, and parents should discuss their wishes with their chosen proxies. By doing so, they ensure their wishes will be known if a time comes when they can’t make decisions for themselves. If you hold power of attorney and/or healthcare agent status, be sure to document your actions and keep siblings informed. You can avoid misunderstandings later by keeping good records of expenses paid and decisions made. What can you do if you’re not making progress? Sometimes siblings can’t reach agreement on how their parent will be cared for and who will provide and/or pay for care. When you can’t negotiate an arrangement with your siblings, you need outside help. A life care professional or elder care mediator may be able to help you and your siblings something work out. If all else fails, you may have to consult an elder law attorney and sue for conservatorship of your parent. Sadly, nearly 60% of elder abuse occurs at the hands of family members. If you suspect abuse, you should consult an elder care attorney and/or call Adult Protective Services (APS). Especially if your parent suffers from cognitive deficits, you need to be watchful. 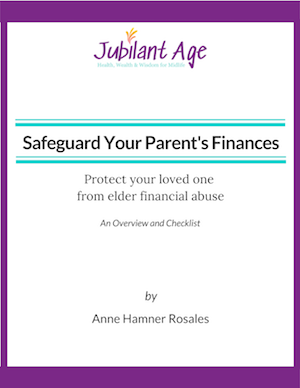 Click here for more information on how to safeguard your loved one’s finances. This post has offered tips on how you can reduce sibling friction over elder care. Remember, however, that you also need to determine how to work with your parents to honor their goals and autonomy as best you can. Recognize that siblings differ in how they handle news like parental illness. For some, it’s hard to accept that a parent has become fragile. It may be even harder to come to grips with that parent’s mortality. Separate your parent’s needs from your own – and yesterday’s battles from today’s decisions. Consider the fact that your relationships with your siblings will continue after your parents are no longer alive. Do you want to preserve these relationships? What do you need to do now so you’ll maintain them going forward? Working together as adults on a major undertaking like elder care can give siblings a chance to see they’ve matured and changed. You can learn to appreciate each other’s strengths. You may even grow closer to one another as adults than you were as kids. As challenging as elder care can be, learning to work it out with your siblings has benefits for you as well as your parents. You can think of elder care as a gift you give to your parents. But it’s also an experience that teaches you and your siblings some things you didn’t know before. Send me your stories about sibling friction over elder care. We all can learn from each other.